This is because this corner of the world is one of the last areas that we haven't really figured out, in terms of what goes where. There is sort of just some random stuff dumped there right now. That will change pretty soon. Expect the next few island snapshots to show a lot of big changes. We've reached the point where the basic gameplay is settled, I'm refining many of the specific puzzles, and we've got at least rough drafts of many of the architectural layouts. That means we can start planning the island a bit better. Over the next month or so, we're going to be changing the shape of the island to something a little more geologically plausible, something that carries more information. It's going to be interesting to do this without disrupting the gameplay layout of the island too much. We certainly could have shipped the game with the old area in the caves with the old puzzles, and probably shipped the game at least a month sooner, but an important skill in building a beautiful game is knowing when something just isn't good enough. Next I am going back to the endgame, which I did my first pass at last summer sometime; I've got a gameplay hook to add which I think will bring it over the top and make it extra-good. I'll be working on that over the next few weeks while also working with the landscape architects on the island revision. Also, we've got a new programmer starting soon (this week or next!) Combined with our other new addition, who's been here a few weeks (Andrew Smith, ex-Zipper and -Oddworld; hi Andy!) we will have quite a bit of tech manpower to bring to bear on finishing this game. The trailer for Dear Esther is out now. So great to see the island progressing. Is it very difficult to throw out puzzles you’ve worked hard on, just to make the game better? I know a lot of developers and artists (including myself) who would struggle to make the decision to get rid of work – especially if you’d spent a lot of time on it. Thanks for doing everything you can to make the game as good as it can be. It’s against the natural human impulse, yeah. But my training as a programmer has made it much easier, because good programmers often scrap entire systems 5 or 6 times before they finally have the thing that works properly and feels good. Once you’ve seen how effective that is, taking that philosophy to the design side becomes natural. Also, because I did Braid and this kind of heavy editing happened there too, I have seen how it comes out in the end (and can imagine how it would have come out if I had not held to quality standards). This brought back the vivid memory of Chris Marker’s excellent documentary AK, which quietly follows the making of Akira Kurosawa’s ‘Ran’. Kurosawa wanted one shot of his Lear-like King riding on horseback by moonlight through a cornfield. His production crew spent days painstakingly painting the corn gold, such were the visual demands of their director, and constructing a giant paper moon to sit low on the horizon. However, Marker’s documentary is the only extant footage of what Kurosawa intended because at some point in the edit he deemed the shot unnecessary, despite its legacy of man hours. Even in Marker’s handheld b-roll footage it looks extraordinary; one suspects a lesser director would have made a different call. Looks sweet, can’t wait to play it. I saw a quote from the dhammapada on the front page of this website. You going to be exploring some Buddhist themes in the game? Wonderful to see the progress you are making. Reading your development posts has helped refine my expectations for developing my own games. It’s been very educational–thanks! It looks beauutiful! People were saying that it looked like Mirror’s Edge some how, but this is way better! It is great that you don’t settle for the finish thing and keep going over and re-thinking things that are already done and finished; Braid benefited alot from this proses of editing andjust adding more and more *but also subtracting* the weak stuff. Even when you had been working on it for 3 years you just want to make it all it can be until is perfect, and going over stuff that is already very very good and removie things that are very good but not great, make the game reach its fullest potential. I suppose the more “hooks” the more secrets there is to find and more things there is to witness. I wish all you guys at Teckla Inc. good luck and finish work in the game when it’s absolutely done and completely explored… Also good luck to your new team members, I am sure they are excited to be working with man like you Jonathan; You are like a legend or whatever or a hero, The hero of video games! What about audion progress? How are all the talks and speeches going? You memtion getting the rights to use them would be pain. Do you have an actor for the puzzle designer or is it still you? I am interested in the story part aswell… What can you tell us? Wow, it’s looking more lush. You may have mentioned this in a past post, but did you guys implement some kind of occlusion culling system? It seems like it would be necessary for this type of environment but I couldn’t recall any mention of one. How do you know when a puzzle is good enough? I have no experience designing puzzles but it seems that it must be incredibly hard to objectively judge their difficulty and quality when you are the creator. Also, you strike me as something of a perfectionist. Maybe that is the wrong word, but you have a strong grasp of your own vision. How do you avoid the temptation to constantly rework and improve? Do you ‘just know’ when an area/puzzle is done correctly? You often hear auteurs talk of this sort of intuition, but I never quite bought it myself. I used to be a perfectionist, but the harsh realities of game development beat that out of me. Instead, now I am just someone with high standards. What happens is that you see that at some point you come to diminishing returns, that a large amount of work will only produce a small improvement in the result, and you’d likely be better off putting that work into something new instead. This is a subjective judgement, though. One trap that one also learns to spot and avoid is when changes are being made, but it’s not necessarily making things better, just different. Given the phrasing used in this blog, is it safe to assume that the current plan involves shipping the game within the next 6 months? Obviously stuff falls though and games get delayed (for good reasons too), but you guys are nearing the home stretch? And you don’t need to confirm the 6 months as, like, a hard dead line, because I know journalists would be all over that and some marketing people might get a little antsy, just the general idea. Also, are you bringing the Witness to PAX East in March? Maybe? I know you went to PAX Prime last year with it. Gorgeous as ever :D! The amount of progress since the last snapshot brings the word “woah!” to mind, and it’s a joy to see everything coming together. Are we looking at a release date in the second half of 2012, or does this half sound more probable? It seems that the puzzle count keeps increasing as you progress through development. 427 seems like a large number. Do you plan on trimming the count down in time, or do you think this is about the puzzle count that feels right? I think it’s great for a game to have a large amount of gameplay content, but I’m curious if there is a upper limit where the user feels overwhelmed, and if so I guess a lower limit where the gameplay seems thin and disappointing. I realized after posting that the 427 is too high because it contains some duplicates. I expect the real number is closer to 400. As for whether that’s too many, my feeling is that it’s about right. a/ Can the player run, ride, fly, teleport? b/ Is the player given some indication of where unsolved puzzles are located in the world? I have a question to (two actually) but first let me answer yours, Sumaleth. b/ So far, I don’t think there is. But when an are of the iosland has all puzzles complete 100% something happens and you can see it no matter where you are, so by logic you can tell what areas you have puzzles left and whichs areas are 100% complete. a) Near the camara, infront of the brown structure with the yellow box on top, on the ground, There is a podium for speaking and some stair like chairs. This kind of looks like a set-up for a talk or a speech. Will any of your old talks make it in the game or maybe you record a whole new one just for the game? Because I feel like that little space you did there talks about sharing ideas and talking to people publicly, it kind of gives me a nice feeling, like sharingand talking is goods. Hopefully that little area in the game has some interesthing “hook” because being behind a podium has become a great part of the designer’s life… I guess. b) I know that unlike Braid, The Witness will have no text or visual words *at all* but it will have sound, as in talking but the game is very visual and I was wondering if it will have also Video to complement the sound. And here is the chair, just to show people what I am talking about… But it would be cool to have video aswell! Since is more like a visual game right? We have heard of architects and landscape architects, are there geologists as well? I could see dating and geolocation implications in certain types of rock and formations. Currently there appears to be both sedimentary in the foreground and igneous in back. Are such considerations too far down in the weeds? I see California and Kentucky in the same place. In general, for gameplay purposes, we are modeling a place where different areas are unrealistically close together. So what we end up with will, in the large, not be geologically plausible. But when it comes to details of particular areas, we can turn a more-realistic kind of attention to those. It’s looking fantastic! One question that always comes to my mind when I see these snapshots: will the environment be totally or mostly static, or are you planning to have some ambient animations? I could imagine an animated tide, and possibly animated clouds and birds, or wind effects in the trees. On the other hand, I could also imagine the island being a completely still, serene place. It looks beautiful anyway, I can’t wait to explore it myself! Jon, it was great to meet you at sundance (I was the guy that came up to you and said “can I just shake your hand?” haha). Game is looking fantastic. Really hoping for a 2012 release :) You might have answered this, but any word of publishing formats? DD, retail, etc? We have yet to figure out how the game is going to be published. Right now the main focus is just on finishing the game and making it good. I sense that the game will provide some onirical feeling, like if the world where player are immersed is made of an abstract substance. Like one dream I had about music one day, in my dream I heard someone explaining to me that I was “in the country of the chords”, I remember of a white room, and on the squared floor there was black dots arrangements, like domino dots, and as I walked along the room, someway I could identify each squared chord. The Q.U.B.E gave me this feeling too, of an abstract world, what was sad about Q.U.B.E it was that the developers needed to put something about the nature of that place, they made the place an advanced technological environment, why? why not just an abstract world like “in the country of tetris”? there’s a writter in my country that made some children books, with something similar, “in the country of arithmetics”, “in the country of grammatics”. I noticed that too and I like it. Its the same as Braid… Like It’s very realistic but there are fantastical things and some impossible stuff that is just out of this world, but If you pat very close attention (atleast in Braid) there is noting fanjtasy about it. It is based in the real world. And I like that. Just like Tim, I, in the real world can dream of worlds and play with time. I hope the Witness is like Braid in that way… Realistic and possible, not graphycaly or structurally but in the sense of what is going on and why. Like if it was some sorth of test that you had to do to get ready for something so you had to go to the island and witness some events to get ready to… go to space or something or something like the movie Moon where is part of a company’s schedule or it was all voluntary and you went to the island as a silent retreat or something to find your inner self… but why do you have amnisia? Braid was like: I come from work, go home, lay on something and sleep and dream about time and space and maybe take brakes and go look at the stars and try to understand how time behaves to create this great thing. Jonathan, what are your toughts on currect tech and the future tech for games and computers? …you know, you being a technical guy I’m curious. 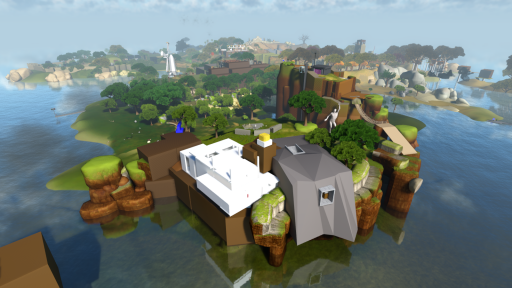 What are you aiming tech wise with The Witness since its 3D? What programme(s) are you building the model in? In the snapshot the grey building looks like an early Zaha Hadid / Marcel Breuer. I know that there will be no music in “The Witness”. However, I’m just thinking about what music would be good for background. I have an option: ambient musics made by Brian Eno. It will be hard to hold out next year before I can finally experience the mystery of the island. Is there a chance that “The Witness” will have more endings than one? Does the main character have any appearance, that player can see, for example when he’s looking into the water? I’m not Jonathan or anyone working on this game but some of these questions have been touched upon earlier. I believe it has been said that there will be no time of day cycle. I’m getting the impression that shadows and the way lights hit things might be clues to some puzzles, and obviously having the sun move about all the time wouldn’t work. Additionally, I think the light map system they are using would make it difficult to make any major changes to the lighting. The character appears to have some sort of an appearance. In some screenshots you can see the shadow of your character, although it looks really blocky and weird. However, Jonathan said that the model was a placeholder, so I imagine the final character will look more human. I don’t know if you can see your reflection, though. I have no idea about the endings. My guess would be no judging from the information so far, but that is just speculation. I believe Jonathan said there would be some replay value because you don’t have to complete all the puzzles the first time (so you can go back and do the ones you missed) and there are some secret puzzles, but I don’t know if that will give you a different ending or not. Hope this helps a little bit!